Indigenous tourism has the ability to foster, promote and preserve Indigenous culture and traditions and is closely in line with Indigenous perspectives. In Canada, Indigenous tourism has been developing at an exponential rate. 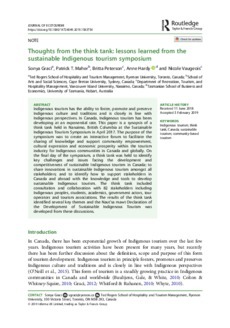 This paper is a synopsis of a think tank held in Nanaimo, British Columbia at the Sustainable Indigenous Tourism Symposium in April 2017. The purpose of the symposium was to create an interactive forum to facilitate the sharing of knowledge and support community empowerment, cultural expression and economic prosperity within the tourism industry for Indigenous communities in Canada and globally. On the final day of the symposium, a think tank was held to identify key challenges and issues facing the development and competitiveness of sustainable Indigenous tourism in Canada; to share innovations in sustainable Indigenous tourism amongst all stakeholders; and to identify how to support stakeholders in Canada and abroad with the knowledge and tools to develop sustainable Indigenous tourism. The think tank included consultation and collaboration with 82 stakeholders including Indigenous peoples, students, academics, government actors, tour operators and tourism associations. 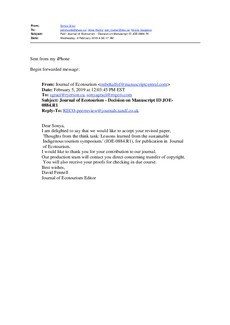 The results of the think tank identified several key themes and the Naut’sa mawt Declaration of the Development of Sustainable Indigenous Tourism was developed from these discussions.